KASHIHARA, Nara Pref. (Kyodo] A wooden carving of a bird with spread wings has been found in the ruins of what is believed to be the moat of a burial mound dating back to the first half of the sixth century, local researchers said. The artifact was found near the excavation site of a burial mound marked Shijo 9 at the Shijo Ruins in the city of Kashihara. The mound, measuring 30 meters in diameter, was part of a 210-sq.-meter site the Nara Prefectural Archaeological Institute is studying prior to the construction of a road. According to the institute, it is the first time a bird with spread wings, which the ancients apparently believed carried the spirits of the dead, has been discovered at a burial mound. Researchers said they found a total of nine wooden carvings of various objects, including cone-shaped hats, in the ruins of a ditch roughly 4 meters in width on the south side of the mound. All the carvings were made of Japanese parasol fir. The bird is about 90 cm long and has a wingspan of about 1 meter. It was made in two pieces, with the wings slotting into the body. Archaeologists believe the bird was among several placed on stakes and pitched around the mound in the vicinity of the moat. They said the discovery is important in understanding the burial ceremonies of the time. 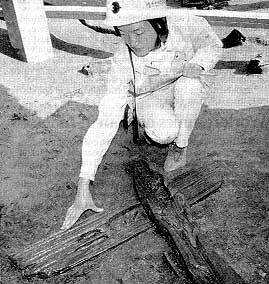 The items will be displayed at the institute on Friday from 10 a.m. to 4:30 p.m.
OSAKA - A researcher on Tuesday crouches above a wooden carving in the shape of a bird recently unearthed at the Shijo Ruins in Kashihara, Nara Prefecture. The carving is believed to have been made in the first half of the sixth century.